Soldiers taking part in Estonia's largest-ever military exercise found themselves in charge of a lost baby moose while out on manoeuvres, it's been reported. According to the Estonian World website, the troops came across the calf while taking part in the country's large-scale Siil 2018 exercises. With its mother nowhere to be seen, soldiers asked environmental experts what to do, and were advised that the animal's mother would probably come searching for it once night fell. The same experts also dispelled the myth that the calf would be abandoned by its parents if it had been in contact with humans, Estonian World said. 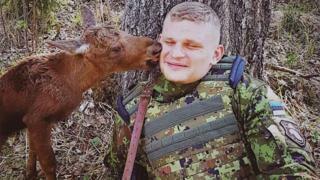 Writing about the unusual incident on its Facebook page, the Estonian Defence Ministry said fresh animal tracks the following morning revealed the young moose had indeed been returned to the bosom of its family. The Siil ("Hedgehog") 2018 exercise, which ended this weekend, involves some 15,000 troops to "test the mobilisation mechanisms of the Estonian Defence Forces, and to conduct manoeuvres all over the country." As well as the Estonian troops and reservists, some 2,000 troops from NATO countries, including the United Kingdom, and other allies also took part. Defence minister Juri Luik said the "Hedgehog" exercises were intended to show that Estonia, on NATO's eastern frontier with Russia, is well defended. "Our task is to show our opponents that attacking us would be so risky that the costs of such a step would outweigh any potential gain," he said. But things haven't gone entirely to plan, after some 1,700 reservists failed to turn up for duty. Those without a reasonable excuse for their absence will now face misdemeanour charges. The hedgehog, its natural defences providing an apt name for army manoeuvres, narrowly lost out in last month's decision to become Estonia's national animal. That honour, instead, fell to the wolf.